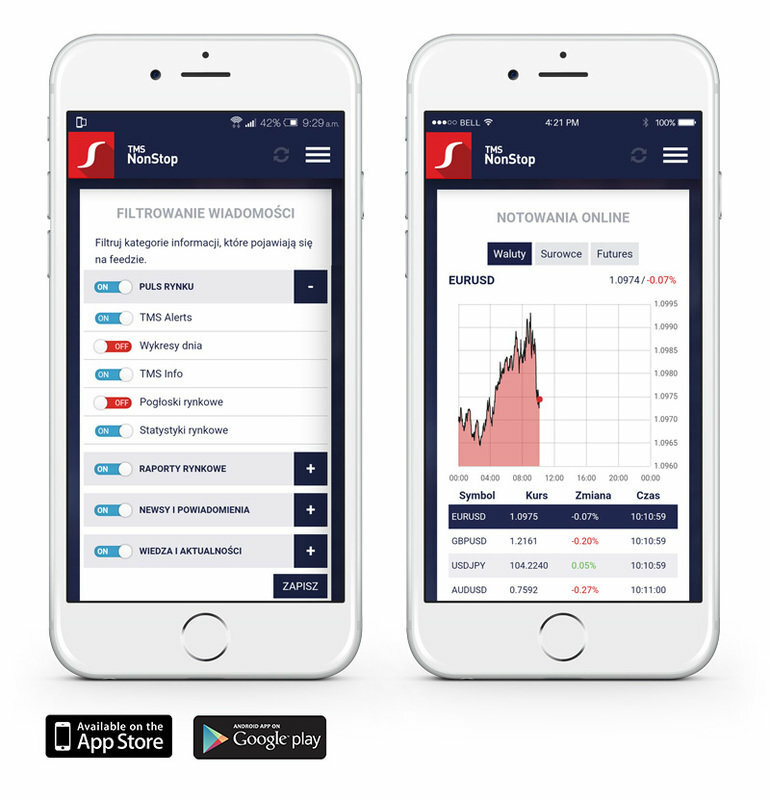 Quick, reliable, cutting edge financial news portal has its mobile app now. It was designed and developed by Direktpoint. Nonstop is a leader in FX market in CEE region and mobile app is a great support for trades which require the latest news from the markets. Team of NonStop editors can send dedicated push-ups, trade setups, individual messages based on the users’ access level. App is available for iOS and Android. Screen from the TMS NonStop mobile app. Construction of a complex online system for presentation of market information coming from many sources, as well as an information portal and investor zone for clients of the Brokerage House. Thanks to our application users can monitor the most important market events on their smartphone screens 24 h/day. TMS NonStop is a unique news and research mobile app offering up-to-the-minute professional analysis and investing tools. Everyday it delivers more than 50 news items, reports, expert comments and trading signals. An app is based on TMS NonStop desktop version with expanded unique system. We developed a fully advanced app in a few different languages. In order to meet the needs of the TMS Brokerage House we have created a portal which aggregates information concerning world finance markets: stock exchange, commodity and currency. The user receives information from Polish and international press agencies, as well as forecast sand reports of the TMS Brokerage House and innovative tools for live market analysis. The main area of the portal is the information livefeed. Reports, recommendations, analysis and opinions - all comments and expert advice of TMS Brokers analysts in one place. 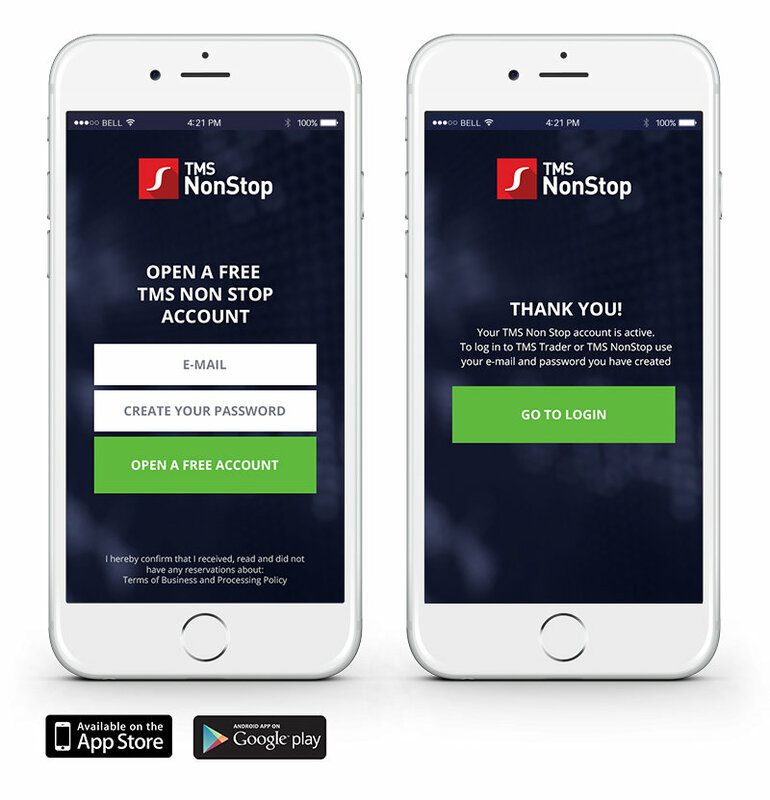 TMSNonStop application is free and available in different versions dedicated to the most popular mobile operating systems. Everyone needs a different type of information, so it was made possible for everyone to build their own navigation dashboard. More than 25 modules with important data related to the currency, stock exchange, raw materials and commodity markets have been made available. Together with TMS NonStop, the clients of the Brokerage House can manage funds on their brokerage accounts. The user, having a range of analytical tools at his disposal, is following the trends and changes in the market, which allows him to search the best investment opportunities. The combination of the informative and analytical possibilities of the TMS NonStop service with the brokerage account management panel makes investing more efficient, more comfortable and more secure. As a part of the campaign promoting the TMS NonStop contest, we have created a 35-second video. The video was broadcast on TV theme channels and the Internet. Download iOS and Android app.